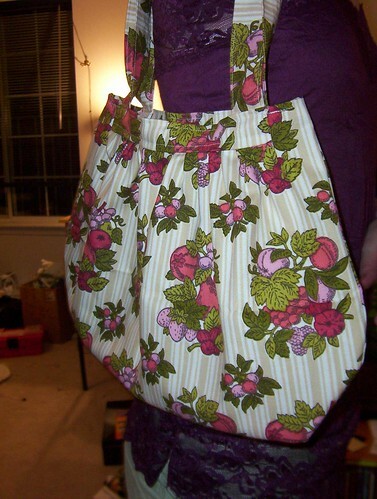 The fabric was some stuff I found in my basement, and my mom told me after I finished the bag that my grandmother's kitchen curtains were made of this fabric. My grandma's been dead a long time, so I think it's pretty cool that I could recycle something of hers (and without even knowing it!). 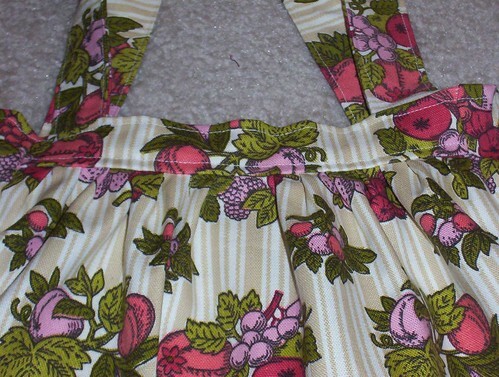 I also totally love that the fabric is vintage. Anyways, that's about it, I hope you guys like it!! ETA: There's a tutorial on page 2 now!! If you make this bag, I really want to see! I love, love, love your bag, too. It is sweet. What size is it. I really like the material. I love it! It looks so nice and big... I think your topstiching looks great too. All around fabulous. 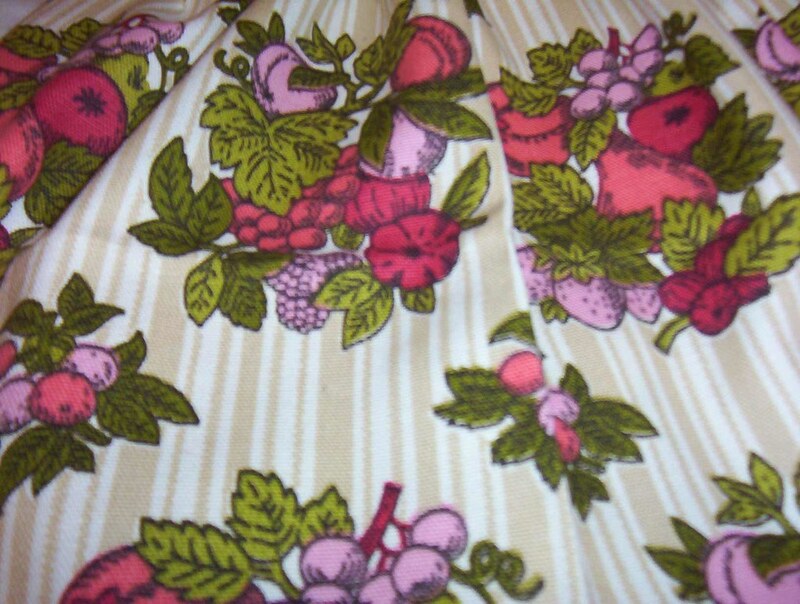 I love vintage fabric... it always has that great olive green color in it I swear! i adore it how did you come up with that pattern? oh my gosh! that's beautiful! Thanks guys! I'm glad you like it! I'm thinking of making some more for my roommates, and if I did, would anyone be interested in a tut? Let me know! For those that were curious, it's pretty big. 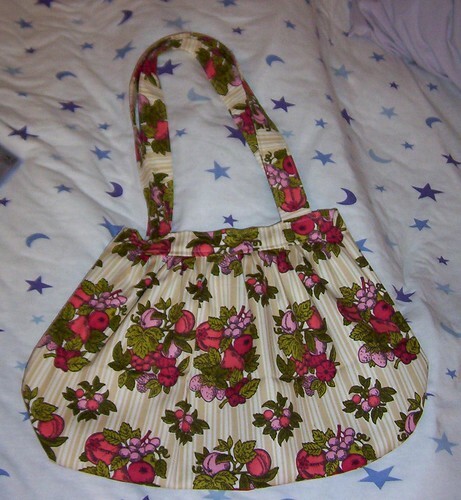 About 10 inches tall by 15 inches wide at the widest point for the bag, and the strap is also 10 inches tall. It fits very nicely on my shoulder, and it's big enough to hold a lot of stuff, but not soooo big that it's unwieldy. zowolf, I honestly just started cutting and sewing it and this is what happened. Pretty lucky, eh? I knew what I wanted it to look like, which helped, and I was somewhat inspired by tinafish's slouchy hobo bag on this board. That fabric is SO COOL! I'm thinking of making some more for my roommates, and if I did, would anyone be interested in a tut? Let me know! firstly, i must say..lucky roomates! and secondly, i'm in favor of a tute please. i still can't get over how GORGEOUS it is!